The UF Health Breast Center’s comprehensive medical team provides compassionate care and personalized options for you and your family. We bring together clinicians and researchers dedicated to the prevention, diagnosis and treatment of breast diseases. 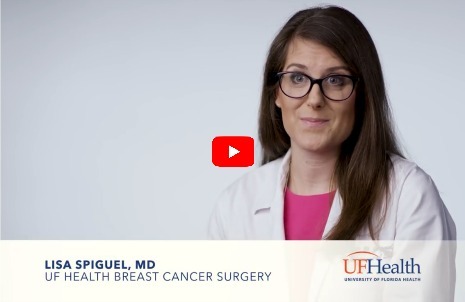 Our mutli-disciplinary team features UF Health breast surgeons, plastic and reconstructive surgeons, medical oncologists and radiation oncologists working together to streamline care for women diagnosed with breast cancer as well as women at high risk for breast cancer. You can also read about Debbie's story or read a blog post about the details of her care. Our nationally recognized experts offer state-of-the-art treatment options for benign and cancerous breast conditions, including therapies that are available only through clinical trials. We also provide services for women who are at a high risk for developing breast cancer. You can read more about Dr. Spiguel's story here. With one phone call to (352) 265-7070, patients can schedule all appointments and receive personal assistance from our breast center team, which is available to answer questions and coordinate medical services. When should women under the age of 40 consider having mammograms? How quickly are patients seen by breast cancer doctors at the UF Health Breast Center? My mammogram identified a suspicious lump what happens next? What is breast MRI and who should get one? Why should I have regular mammograms? How are digital mammograms different from traditional film mammograms? What happens if something suspicious shows up on my mammogram? What should I expect when I come to UF Health Women's and Diagnostic Imaging for my mammogram? What are dense breasts and why does it matter?